KUALA LUMPUR (THE STAR/ASIA NEWS NETWORK) - On the day after Christmas, my true love gave to me, a table of leftovers and a collection of tasty new meals. I don’t know about you, but I don’t want to eat the same Christmas meal two days in a row, no matter how delicious. In my family, it’s usually rich and comprises meat cooked in every way possible that just thinking of twice the overindulgence makes me break out in a sweat. Some families, mine included, may have a couple of hearty young eaters who could tag team a 5kg roast turkey and polish it off over the course of an extended lunch. Even then, the Christmas table tends to be extra abundant and there will be leftovers. Here are a few ideas for what to do with them, as well as six recipes. Because everyone’s Christmas meal is so varied, instead of looking at repurposing leftovers of specific dishes, our recipes involve types of food, such as roasts, curries, desserts and vegetables. Leftover butter or sponge cake, for example, is perfect in a trifle or even a cheat’s tiramisu. With angel cake, one of the simplest and best things to do is to toast thick slices of it in a grill pan and serve with a fruit coulis. This would work well with fluffy panettone too. The sweet loaf with the festive flavours and candied fruit makes delicious bread pudding, as do other rich yeast-raised loaves, like buttery brioche and swirly babka. Or turn leftover bread into melba toasts to serve with a dip or as the base of hors d’oeuvres. Crumbled pavlova and meringue biscuits are good as ice cream topping; waffles and muffins can be sweet or savoury – try adding roasted vegetables to the batter. On Boxing Day, there is a British tradition of frying slices of leftover steamed pudding in butter and eating with brandy custard. Because of the generous amount of fruit in it, it is sometimes combined with savoury flavours. I have seen recipes for it used as stuffing in duck breasts – just as the meat would be served with something sweet like grilled plums. Another recipe has chunks of pudding wrapped in strips of phyllo pastry, baked and drizzled with honey. Meat and roasts always make lovely grilled cheese sandwiches, but putting slivers of them in a spring roll with lots of salad leaves is just as good … and a healthier option after the lavish spread. And now the recipes. Happy Repurposing! The fabulous harira, on which this recipe is based, usually starts off with a nice beef bone marrow and takes a couple of hours to produce a flavourful stew. This one has all the aromatics used in a harira but takes hardly any time to make. Roast beef or lamb is the best meat to use – if we can’t make the real thing from scratch, we can at least have a cheat’s version that tastes alike. 1. Heat oil in a pot. Add onion and fry over medium low heat until soft and a little brown, 10 minutes. Stir in the garlic, then the chickpeas and tomatoes. 2. Add coriander roots, turmeric, ginger, cinnamon and a few grinds of black pepper. Add the lemon juice. 3. Pour in stock and add a pinch of salt (but not if using a stock cube). Bring to the boil and then simmer, covered, 7-8 minutes. 4. Stir in the paprika and cayenne pepper. Check the seasoning and add more salt and pepper if necessary. 5. Tear up the coriander leaves and add half to the pot along with the leftover roast. Simmer for 2 minutes. 6. Thicken the stew with the corn starch slurry. Serve with the remaining coriander. 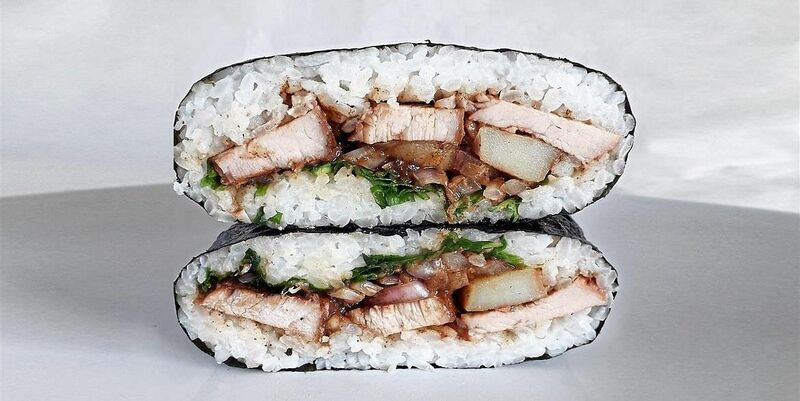 The Japanese rice “sandwich” featured here is made with leftover vindaloo. Cut the chunks of meat into thin slices so they can be layered evenly. If you like, add cooked potato or hard-boiled egg. Use warm rice or the nori will remain crisp and you’ll have trouble biting into the onigirazu. 1. Season the rice with the sushi seasoning to taste. 2. Place a piece of cling film slightly larger than the nori on a work surface. Place the nori sheet, shiny side down, in the middle of the cling film. 3. Place half the rice in the centre of the nori. Using wet hands, press into a rough 7cm square. Arrange the meat slices on top and add some of the gravy. Top with salad leaves and onion rings. Cover with the other half of the rice, packing it down lightly. 4. Bring two opposite points of the nori sheet over the filling, overlapping slightly in the centre. Tuck in the corners neatly, as if you were wrapping a gift, and bring the other two points together to enclose the filling completely in a square parcel. 5. Wrap the cling film around the parcel snugly. Leave for 5-10 minutes to let the nori soften. 6. To serve, cut onigirazu through the centre with a sharp knife. Remove the cling film before eating. This dish is the perfect way to repurpose roast vegetables and potatoes (or other root vegetables). Instead of cooking the B&S as one large disc, you could make small patties. 1. In a bowl, mix potato and garlic. Set aside. 2. Melt butter in a 15cm non-stick pan. 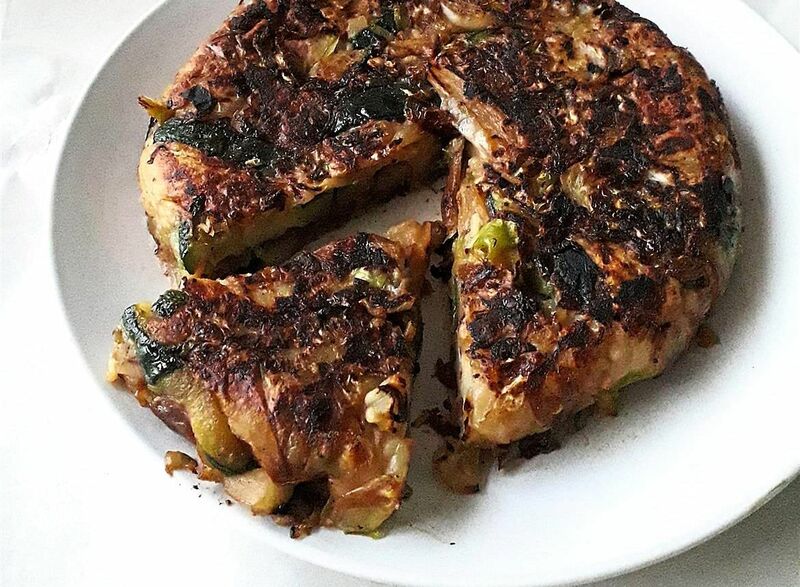 Add cabbage-courgette mix and cook on medium heat until slightly browned and crisp (there’s a lot of flavour in those caramelised bits!). Stir in fried onion. Cook 1 minute. 3. Add mashed potatoes and stir everything together in the pan. Press mixture together to form a thick disc that covers the base of the pan. Cook until the bottom is brown and crisp. Flip the disc and brown the other side. 4. Cut into wedges and serve. 1. Preheat oven to 180 deg C. Line 3 ramekins with 2 paper cases each. 2. Beat the cream cheese, sugar, vanilla and lemon juice until light and creamy. Beat in the egg just until combined. 3. Mix biscuit crumbs and butter until it resembles wet sand. Divide the crumbs between the paper cups and tamp them down. Top with small pieces of fruit, if using, then spoon the cream cheese mixture on top. Bake for 15-20 minutes or until slightly risen and just beginning to brown. 4. 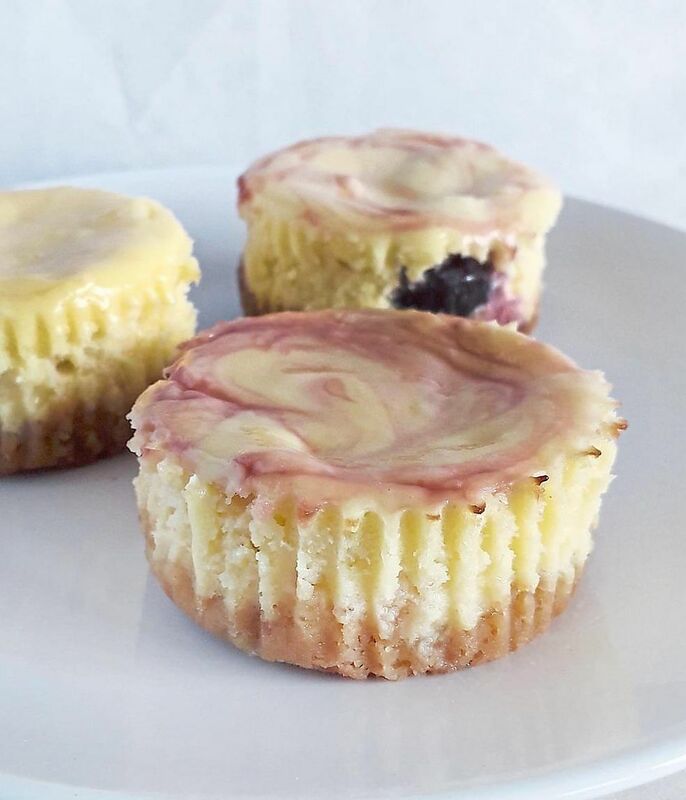 Set aside for 10 minutes before removing the cheesecakes from the ramekins (leave the paper cases on). Place on a wire rack to cool completely. Refrigerate for 1 hour or until chilled. Remove the paper cases before serving. 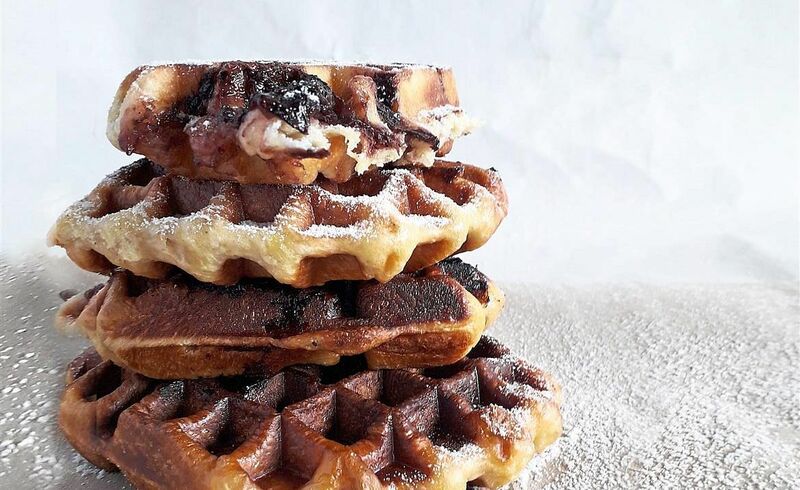 You could use just the filling from a fruit pie, but including the crumbled crust adds flavour to the waffles. If you don’t have a waffle iron, simply cook as pancakes in a frying pan. 2. In a clean glass mixing bowl, beat the egg whites until stiff peaks form. In a separate bowl, mix together the egg yolks, milk, oil and vanilla. Add to the dry ingredients and mix well. 3. Fold in the egg whites followed by the crumbled fruit pie. 4. Cook in a well-oiled waffle iron on medium-high heat for 5-10 minutes until golden brown on both sides. For some reason, there’s always leftover fruit cake after Christmas. An Italian meringue – made with heated sugar syrup – is more stable than just beating egg whites and caster sugar together, but it does require a candy thermometer and more care during preparation. Instructions for Italian meringue are given below, so use whichever method you prefer. 1. Place a 2cm-thick slice of cake on a heat-proof plate, put a large scoop of ice cream on top and freeze. 2. Place the egg white and lemon juice in a clean glass or metal bowl. Using an electric whisk, beat together until frothy. Add sugar, a tablespoon as a time, and beat until glossy and meringue forms stiff peaks. 3. Take cake-ice cream base from freezer and spread or pipe on a thick layer of meringue, completely covering the base. Make swirls or spikes with a fork. If desired, return the dessert to the freezer for 30 minutes. 4. When ready to serve, use a blowtorch to brown the meringue. Alternatively, bake for 3-4 minutes in an oven preheated at 190 deg C. until light brown. 5. 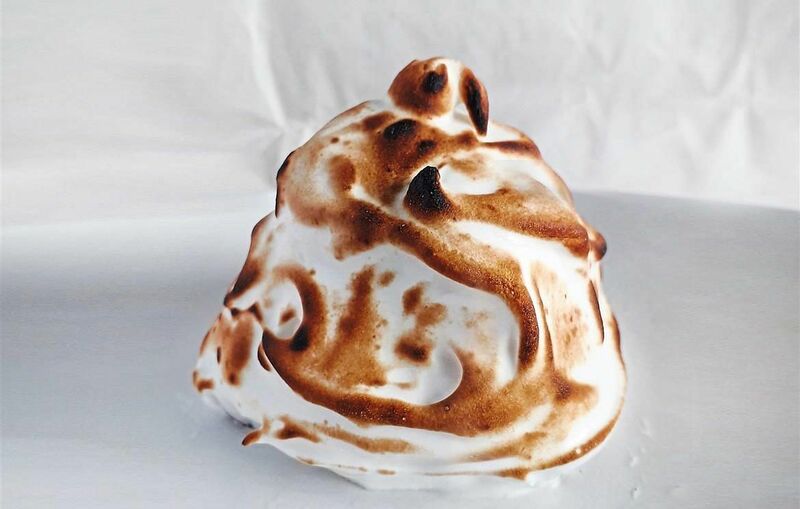 To make Italian meringue: Combine sugar and water in a heavy saucepan over medium heat. Cover pan and bring to the boil. The condensation in the pan will prevent the sugar from crystallising. 6. Once the sugar has completely melted, take the lid off and cook until syrup reaches 110 deg C. on a candy thermometer. 7. Meanwhile, place egg white and lemon juice in a clean metal bowl and whip with an electric whisk on high until soft peaks form. 8. When the syrup reaches 118 deg C, take it off the heat. With the whisk running on low, slowly and carefully pour the syrup in a steady stream on the whipped egg whites (avoid the rotating beaters or you’ll be cleaning meringue off yourself and the kitchen walls!). When all the syrup has been mixed in, turn the whisk back on high and whip until glossy and meringue forms stiff peaks.